Winter weather has arrived. Are you ready to snuggle under a blanket and hibernate for the season? I say grab your hiking gear and go outside! Staying active year-round improves health, mood, and school performance. For your next snowy adventure, try these nine tips as you go hiking with your kids. I know it's tempting to tell the kids to go outside while you sit inside with your toasty hot chocolate. Our kids need us to model good habits, though. Zip your jacket, grab your enthusiasm, and go outside with your kids. They need the fresh air, exercise, and time with you. On summer hikes, my girls and I easily walk three miles before we start to feel tired. Winter hikes take a lot more energy, though, as we navigate the snow and cold. I suggest you set realistic goals, try short hikes, and increase your hike lengths gradually as your kids adjust to this fun winter activity. Safety comes first during winter hikes, so dress in layers. Start with a base coat that traps moisture, add an insulating layer for cold protection, and finish off your outfit with an outer layer that repels cold or wind. Remember the hats and gloves, too, as you limit exposed skin. Let's face it: A hike can turn into a chore quickly, especially for young kids. Make it fun when you add games. My girls look forward to making snow angels, building snowmen, and looking for wildlife on our winter hikes. What other games could you play together on your next winter hike? I'm always on the lookout for educational opportunities. That's one reason why I challenge my kids to look for animal tracks when we hike. If they don't know which animal made the tracks we see, we sketch them or take a picture and research the tracks when we get home. We hike one local trail every summer, yet I noticed this past weekend that it looks totally different in the wintertime. As you hike your favorite trails this season, challenge your kids to spot the ways its appearance changes based on the winter weather and time of day. Whether it's the funny faces my girls make as they catch snowflakes or the breathtaking ice crystals we see on the trees, I love capturing pictures of our winter hikes. You, too, can keep a photo journal of your adventures and capture all of the highlights. Hiking is fun, but it's also hard work. I always pack healthy snacks like apples, granola, and peanut butter crackers. A container of hot cocoa also comes in handy when we take breaks to catch our breath, watch birds, or look at the landscape. My girls are still too young to hike alone. But when they are teens, I'll encourage them to nix the adventurous solo winter hikes and go with at least one other person. I suggest you hike in groups whenever possible, too. This way, you'll be able to keep each other company, look out for danger, and have twice the fun. 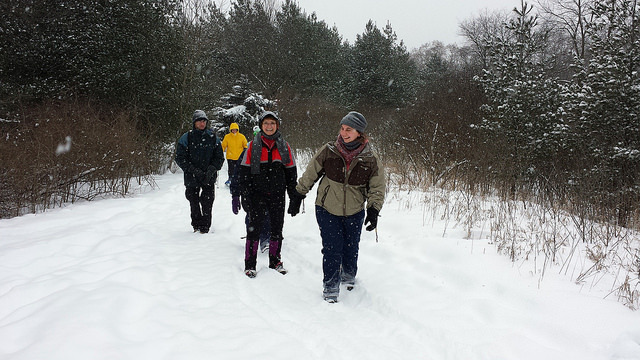 This winter, go on a snowy adventure and take a hike. You and your kids will have a blast as you stay active. What are you waiting for? Go hiking today!